Home / Creative Crafts / DIY: It just takes a little tape! DIY: It just takes a little tape! We've got new decorative tape in, and we wanted to show you some simple ideas we've come up with to use it! Step 1: Grab a cute kraft bag from Creative Packaging. Step 2: Use some ribbon and our new decorative tape to decorate it! 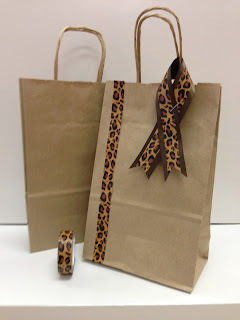 Stay tuned for more fun ideas for using decorative tape or email your own to creativepkg@gmail.com!